In the most common form of PAD, arteries in the legs (and sometimes arms) narrow and harden as a result of fatty plaque deposits, leading to decreased blood flow in the legs and feet. Symptoms of PAD include intermittent claudication (cramping leg pain that develops while walking and stops with rest); numbness, coldness, or tingling of the legs and feet; and slow healing of cuts and sores on the affected extremities. 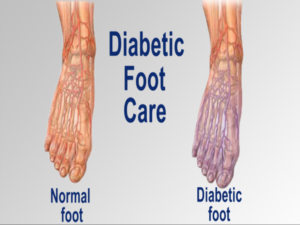 Diabetic peripheral neuropathy is a common complication of diabetes in which nerves in the feet and legs (and sometimes hands and arms) are damaged, resulting in pain and/or loss of sensation. Weakened nerve fibers may give off false sensations in the extremities, often experienced as pain or burning; cramps and extreme sensitivity to touch may also result. The Diabetic foot is often encapsulated by wound care and ulcer management experts, yet the causes of complex mechanical pathologies are often overlooked in the most severe cases. – Will depend on the deformities present i.e. hallux rigidus, hammer or claw toes, hallux valgus. Assured Health Physiotherapy, offers custom-made orthotics specially designed for people with diabetes using special material to increase blood circulations.